The sun finally came out after I got home from teaching today, so I took my camera out for a critter hunt. I'm really enjoying the "super macro" capability of my extension tubes. In order to use the tubes, I have to find something very tiny to photograph. 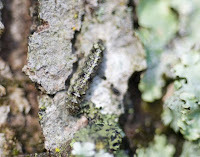 The first interesting critter I found was a 1/2"-long caterpillar that was extremely well-camouflaged against the lichens on the dogwood tree. I don't know what it will turn into, but it is most likely a moth caterpillar. The magnolia cones have begun to fall from the two large trees we have in our yard. Thanks to all the rain we've had, the mushrooms are growing quite well. One fascinating little (2" maximum) fungus is the Magnolia Cone Mushroom (Strobilurus conigenoides). As its common name implies, it specializes in decomposing the fallen cones of Magnolia trees. I especially like that the mycelia are visible in this photo. I guess my neighbors must think I am crazy sometimes when they see me with my tripod inches from the house, laying on the ground or propped up against the wall with my camera! 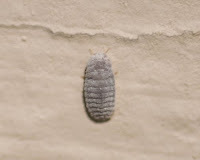 I spotted some weird little insects (~3mm) crawling up the wall. I'm assuming they are some type of nymph. I'm hoping someone from Bugguide.net can identify them. 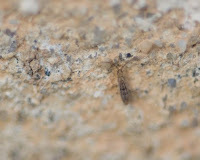 Later I saw some tiny, thin, brown insects (~2mm) at the base of the wall. 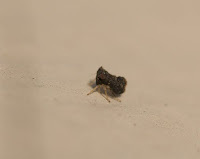 I thought they were probably a type of Springtail (right), sure enough, as I was focusing on one, it catapulted off the wall! ***Update: The Bugguide folks came through for me again! The white insect is a type of Mealybug. The adult females look a lot like a nymph because they do not grow wings. 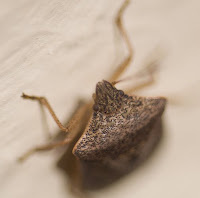 Next, I turned my camera on a stinkbug. I was amazed to see its shell was covered in tiny black indentions. I'm wondering if the two little red dots are simple eyes. 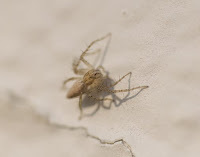 I saw some spiders, but many of them were not too willing to pose for me! Here is one that cooperated long enough for me to get a few shots. Check out those cool eyes!